African Union observers have given national elections in Angola a clean bill of health, despite opposition claims of fraud and illegality. The AU team said the poll had been "free, fair, transparent and credible". Ahead of Friday's vote, the main opposition party Unita had called for a delay, expressing concern about a lack of transparency. The latest count gives President Jose Eduardo dos Santos' governing MPLA party an unassailable lead. With 90% of ballots counted, the electoral authorities said the Popular Movement for the Liberation of Angola (MPLA) has won 73% of the vote, with Unita garnering 18%. A newly founded third party, Casa, is forecast to win 6%. If confirmed, the results mean another term for President dos Santos, 70, who has ruled since 1979. Final results are expected to be announced on Monday. 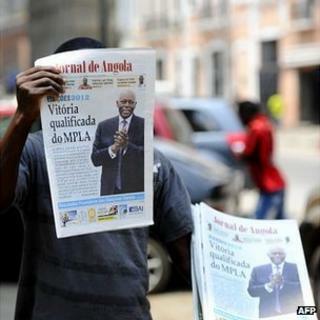 The state-ruin newspaper Jornal de Angola has already declared Mr Dos Santos the victor, saying on its front page on Sunday: "The MPLA is the big winner of the general elections of 2012... Jose Eduardo dos Santos is president-elect." The vote was the second since the civil war ended a decade ago. They were also the first to be held under a newly adopted constitution, under which the leader of the winning party in the 220-member parliament becomes president. The head of the AU mission, Pedro Pires, congratulated Angola's electoral commission, the parties and the voters for their political maturity. But he did point out problems with observers getting accreditation, and said opposition candidates had not enjoyed equal access to the media. Unita has said that the authorities' failure to publish a full electoral roll had cast doubt on the vote's transparency and credibility. Some voters were unable to cast their ballot as they did not appear on lists, despite being registered. Analysts had predicted an easy victory for Mr dos Santos' MPLA, which won more than 80% in the last vote. MPLA officials said the results showed that the party was enjoying widespread support. The MPLA has been in power since Angola's independence from Portugal in 1975. Angola - Africa's second largest oil producer - has witnessed an economic boom since the end of the 27-year civil war in 2002, but the opposition says the wealth has only benefited a small elite. Angola victory for cyber activists? Ten years of peace but at what price?